On August 9th of 1969, four members of Charles Manson's 'Family' followed his orders and carried out the murders of actress Sharon Tate and four of her friends. Three months later it was revealed that Steve McQueen - a friend of the victims who, since the murders, had carried a gun at all times - featured on a hit-list of Manson's known as the 'Death List', alongside various other celebrities. 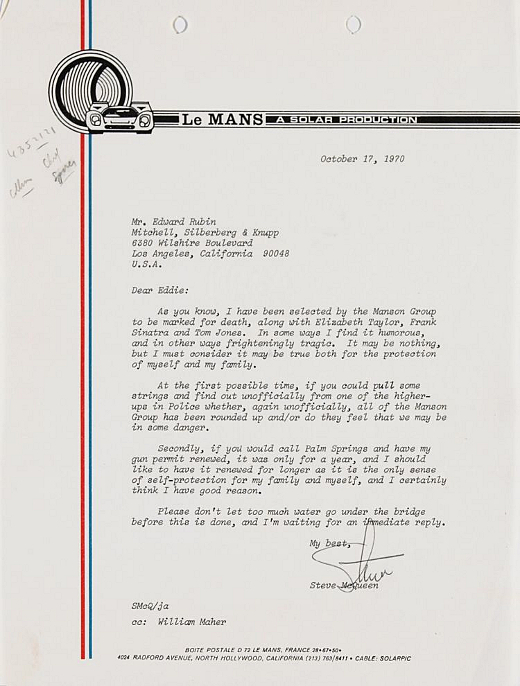 An understandably cautious McQueen wrote the following letter in October of 1970 and sent it to his lawyer, Edward Rubin. Recommended reading: Steve McQueen: A Tribute to the King of Cool. As you know, I have been selected by the Manson Group to be marked for death, along with Elizabeth Taylor, Frank Sinatra and Tom Jones. In some ways I find it humorous, and in other ways frighteningly tragic. It may be nothing, but I must consider it may be true both for the protection of myself and my family. At the first possible time, if you could pull some strings and find out unofficially from one of the higher-ups in Police whether, again unofficially, all of the Manson Group has been rounded up and/or do they feel that we may be in some danger. Secondly, if you would call Palm Springs and have my gun permit renewed, it was only for a year, and I should like to have it renewed for longer as it is the only sense of self-protection for my family and myself, and I certainly think I have good reason. Please don't let too much water go under the bridge before this is done, and I'm waiting for an immediate reply.